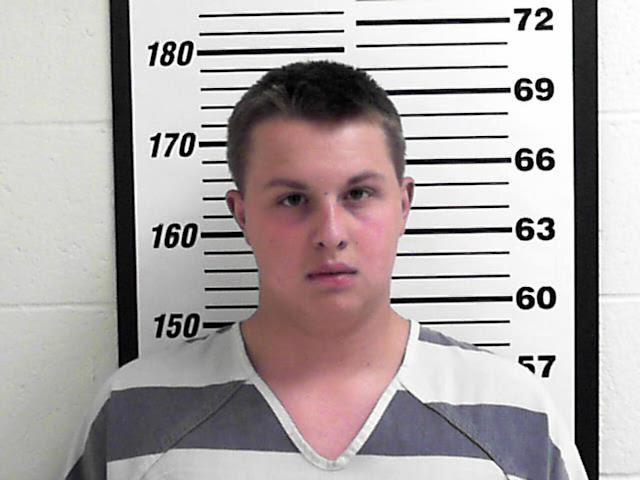 A Subway employee in Utah is accused of spiking a police sergeant's drink with illegal drugs. Tanis Lloyd Ukena, 18, was captured on surveillance video spending an “unusual amount of time” preparing a Layton police sergeant’s drink on Aug. 8, KSL News reported. "In the video, [Ukena] is seen filling the drink portion of the order at the drive-up fountain area," a Davis County Jail report stated. "For some unknown reason, he walks away from the fountain machine out of camera view. He then returns to the drink where he is seen spending what seems to be an unusual amount of time getting it ready to deliver to the sergeant." "The [sergeant] began feeling the effects of being drugged," the report said. "While approaching an intersection that had a red light, he had difficulty getting his foot to move to the brake pedal. [He] drove to the Layton Police Department, where he was observed to have signs of impairment. He was unable to process information and drifted off, and was unable to focus on questions being asked of him." The officer was taken to a local hospital. Layton Police Sergeant Clint Bobrowski confirmed the sergeant was in uniform at the time of the incident. Investigators believe the sergeant was targeted because he is a police officer. "I know that the community here in Utah is overwhelmingly supportive of law enforcement, and we’ve experienced that over the last couple of months ... I think this is a very isolated incident," Bobrowski said. Bobrowski described the sergeant’s condition. "He would have thoughts, but his body wouldn’t react to it," Bobrowski explained. "So if he was trying to move his arm, his arm wouldn’t move when he thought it should. He was having a hard time maintaining his focus. He was having a hard time maintaining his body. His body was jerking. And for a trained police officer watching him, it was everything I’ve seen in people who abuse illegal narcotics." The sergeant has since been released from hospital and is recovering at home. Police did not release the sergeant's name and he is scheduled to return to work. Ukena told police he did take the sergeant’s order, but "denied putting anything into the drink," according to the jail report. Layton police said that an ion scanner test indicated that meth and THC were in a sample of the same drink Ukena gave the officer. The department added that a second test “tested positive for narcotics” as well. Ukena was booked into Davis County Jail and is facing charges of surreptitious administration of a substance, a second-degree felony, Deseret News Utah reported. "We’ve been grateful for the owners and the managers of the Subway restaurant," Bobrowski said. "In no way is this a reflection on the ownership of the restaurant. They’ve been fully cooperative with our police department. We don’t have any fears for the safety of the public. They’ve been great dealing with us, and we would definitely encourage people that eat there to continue to do so."